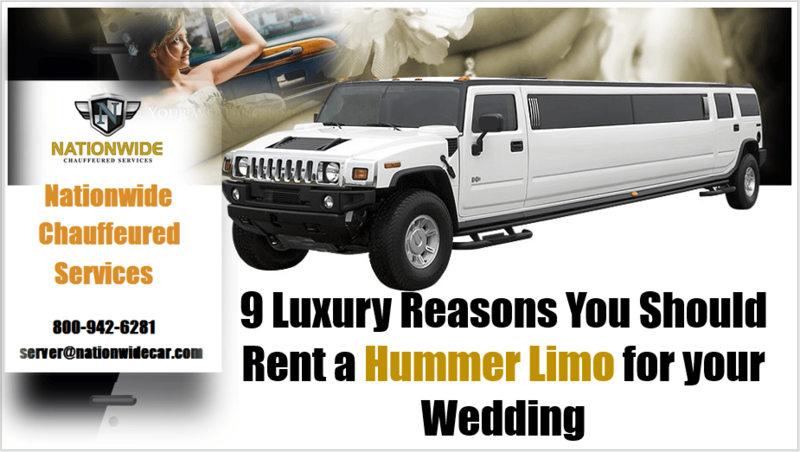 Have you ever considered renting a Hummer Limousine for your wedding day? It’s not only a great way to roll in with high style and in a luxury atmosphere, but it’s a bold way to start and finish your big day! First off, it’s a hummer! As if you need any more reasons than that right? If you want to have an entrance that has never been done before—than showing up in a Hummer Stretch Limo is certainly a way to set you apart from the crowd. Your wedding pictures will be one-of-a-kind. Imagine you and yours hopping out of a Hummer Stretch Limousine. It’s a lot fun! Sure, standard limos are a blast, but a Hummer has all the extra amenities. Experience an environment with an amazing sound system and bass booster. You can even hook your phone or IPod directly into the system and play the songs that you want to hear. It’s super spacious, so there is room for friends! If you plan on going to a new location for the photoshoot, you can bring lots of friends with you and give them the gift of riding in this comfortable and extravagant vehicle. Your driver can take you anywhere you want to go. If you decide you would like to take the long way back to your suite, your driver can take the scenic route through the city. Because sometimes a Stretch Limo Rental just isn’t enough! A Hummer limo takes it to the next level.